Funny story, I was a Journalism major, and seriously considered being a foreign correspondent, even after September 11 changed the face of global reporting during my third year at University. And, shortly after that, a professor was hideous to me and I swore off university-based media. Kim Barker originally wrote Whiskey Tango Foxtrot as The Taliban Shuffle about her experiences within the Middle East, in a place where no one wanted to go. However, in love with the idea of being a foreign correspondent (and not really doing anything else). Kim holds no bars, she frankly talks about a relationship she was in (self-confessing she was on a track for marriage and babies but also battling a sense of abandonment as a child of divorce). She talks about meeting a warlord, wearing the full-bodied cloak of invisibility that would turn her into a ghost (a burqa) in most situations. Kim also has a healthy confidence in her ability to swallow the crap to get to the meat of the stories. Sure, she’s writing about an area that no one cares about at that point in time (starting in 2004), but she’s also learning about herself. She’s learning how to balance negotiations and ignore the beggars. And, she’s singing karaoke with the best of them. Despite her boyfriend’s downward spiral after a spiritual experience in India. And despite the fact that her stories are not being taken as serious news. 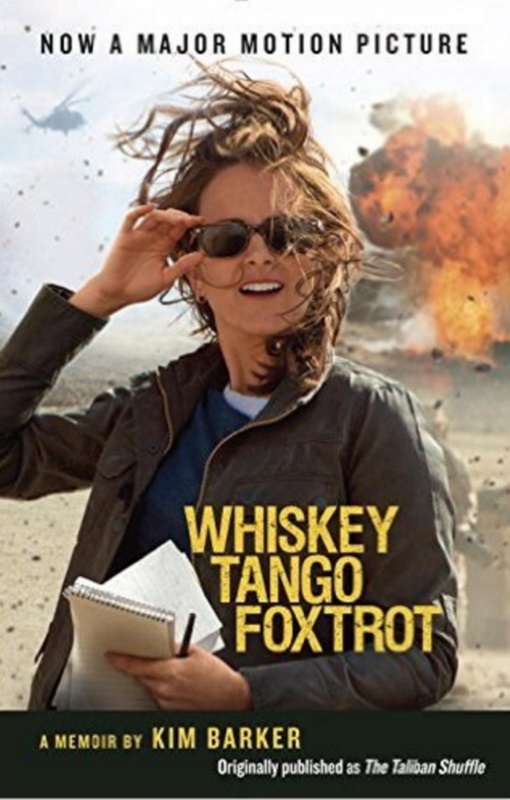 I really enjoyed Whiskey Tango Foxytrot, as it brought back memories of how I felt correspondence work would be, but with a healthy lot of honesty–it is NOT a job for everyone. It is rough, and may require wet nap baths and keeping contacts in for days on end (due to sandstorms). Kim is unabashedly honest and endears me to her more. Farouqh, her translator/major domo, is one of my favorite characters of the book. She talks about his strengths and his character–he could have been a doctor, but being a translator and man about town for a correspondent nets him a TON more money than he would receive as a doctor or surgeon. Despite him being younger, she also is quick to mention how he takes care of her. One minute he is telling her to cover up, the next minute he is pointing out where the suicide bombing took place, along with the bodies. Kim Barker’s memoir is honest, and brings both the exhilaration and spirit of exploration to the front lines of a terrible war. She retains some humor (dark around others, she will explain) and really, her manner of thinking is essential in the war zone. In honor of the film, starring Tina Fey, my copy is a trade paperback featuring the poster from the film–it is easy to imaging Fey as the main character as she holds her sunglasses and notepad as an explosion goes off behind her. Disclosure: I want to thank Wunderkind PR for giving me a copy of the book, in exchange for my honest review–the thoughts are my own. Pick up a copy of Whiskey Tango Foxtrot from your favorite retailer today.